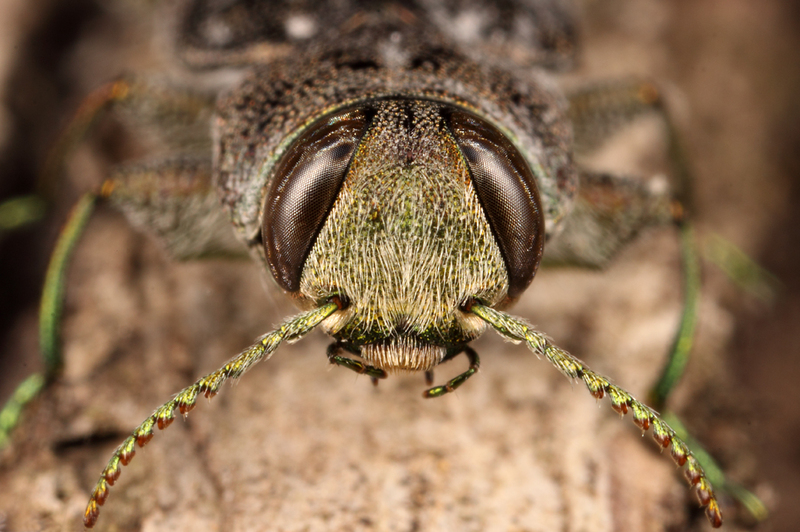 Despite their general popularity among beetle collectors, jewel beetles (family Buprestidae) have an admittedly deserved reputation for difficult taxonomy. Part of the reason for this is the existence of several highly speciose genera. In North America, for example, nearly half of its described species belong to just three genera—Acmaeodera, Chrysobothris, and Agrilus (the latter, with nearly 3,000 described species and many more awaiting description, being possibly the most speciose animal genus in the world). Identification of species within these genera is difficult enough due to their sheer numbers and is further complicated by the existence a number of “species-groups”—i.e., groups of very closely related species that have only recently become reproductively isolated from each other (likely in response to host partitioning) but have not yet evolved obvious unique morphological characters. 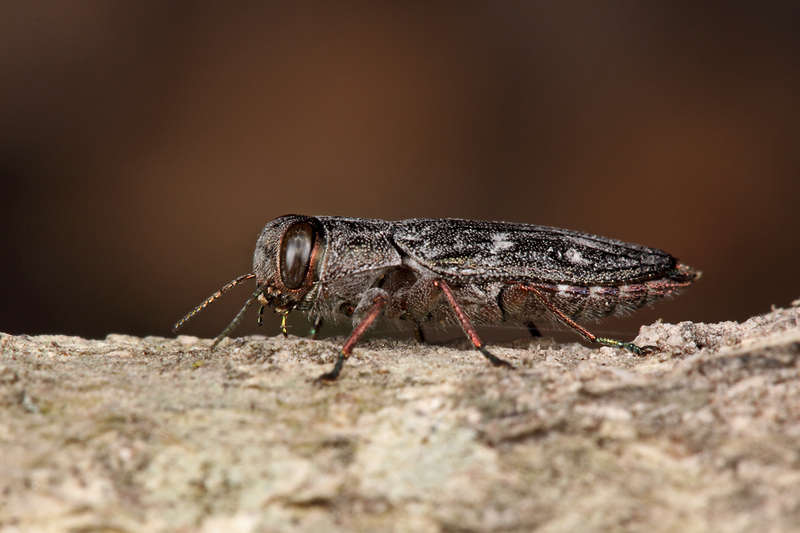 Perhaps the most famous of these is the “Chrysobothris femorata species-group.” A dominant component of hardwood forests throughout North America, members of this group have confounded taxonomists, collectors, and foresters alike for many years. Fortunately, the recent revision of the group and formal description of several species by Wellso and Manley (2007) have brought much needed clarity to the group. While problems still remain (C. femorata sensu novo probably still encompasses several undescribed species), most individuals can now be identified with some confidence. I have previously discussed three of the seven now recognized species occurring broadly in eastern North America—the nominate C. femorata, still regarded as an important pest of ornamental and fruit tree plantings, C. caddo, one of the new species described by Wellso and Manley (2007) and associated with dead hackberry (Celtis spp. ), and C. quadriimpressa, mostly associated with dead branches of oak (Quercus spp.). 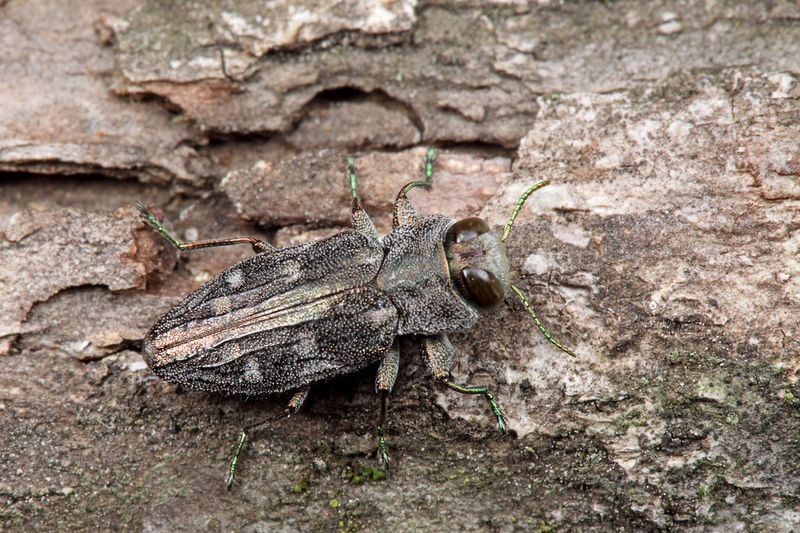 The individuals shown here, photographed on branches of a dead white oak (Quercus alba) in north-central Arkansas this past June, represent a fourth species in the group, Chrysobothris viridiceps. Unlike most members of the C. femorata species-group, C. viridiceps can be readily recognized in the field due to the uninterrupted costa (raised narrow ridge) that completely bisects the posterior fovea (rounded pit) on each elytron. In all other species this costa is interrupted by the fovea. Moreover, this species is the only one in the group in which the males (easily distinguished from females by the bright green frons, or face) exhibit bicolored antennal segments, with the outer portion of each segment yellow and the remainder bright metallic green. While the species name is Latin for “green face,” this character is useless for species identification, as males of all species in the group exhibit a more or less green face. Females are a little more difficult to distinguish in the field because, like those of other species of the group the antennae are more uniformly reddish. Likewise, the face also lacks the green coloration of the male, and although still useful for species identification the differences among females between the different species are more subtle and require microscopic examination. However, as in the male the elytral foveae are completely divided, allowing even females to be recognized relatively easily. One thing I have noticed about the different members of the C. femorata species-group is the usefulness of host plant association in distinguishing the different species. Of the seven species occurring in my region, I’ve seen C. femorata associated mostly with stressed but still living trees in genera other than oak or hickory (e.g., maple, sycamore, apple, poplar, ash, etc. ), C. adelpha associated exclusively with dead hickory (Carya spp. ), and C. caddo associated almost exclusively with hackberry (Celtis spp.). The remaining four species are all associated primarily or exclusively with oaks, but even these species often segregate according to branch size, with C. viridiceps occurring mostly on the smallest branches, C. quadriimpressa on somewhat larger branches, C. rugosiceps on very large branches and the upper trunk, and C. shawnee on large trunks and even stumps. Not surprisingly, these size preferences reflect the relative size of the beetles, with C. viridiceps (7–13 mm in length) generally being the smallest of the four species and C. shawnee (9–18 mm in length) the largest. Okay, now to get photos of C. adelpha, C. rugosiceps and C. shawnee! Wellso, S. G. and G. V. Manley. 2007. A revision of the Chrysobothris femorata (Olivier, 1790) species group from North America, north of Mexico (Coleoptera: Buprestidae). Zootaxa 1652:1–26. 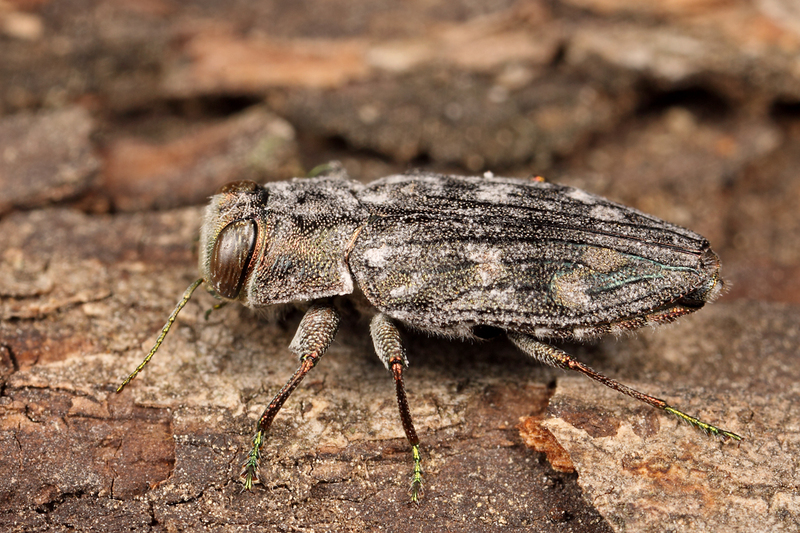 This entry was posted in Buprestidae, Coleoptera and tagged Arkansas, beetles, entomology, insects, jewel beetles, nature, science, taxonomy. Bookmark the permalink. You deliver excellent images of these beetles Ted, its a pleasure to see the close ups, truly inspirational. The head shot ( third one down the page), is my favorite. Why thank you. Readers of this blog soon learn that I have a thing for head shots! I like the green feet, which made me wonder why the species name wasn’t viridipod. I guess it’s going to be one of those days when I should avoid critical thought and shovel snow. Take a look at the vivid blue feet in my photo of Chrysobothris caddo! Very cool, Ted. I’ve only knowingly seen one of this species group. I’m going to have to try to make a conscious effort to check downed trees on a regular basis. I may have some questions for you. I seem to have developed a knack for identifying these guys, whereas others have told me they can’t make heads nor tails out of the Wellso & Manley key. Perhaps because I have so much material of all the species I’ve been able to get a good feel for where the boundaries of variability lie between the species. At any rate, once you get them figured out there is a fascinating natural history tale there waiting to be read.